It’s been awhile since I reviewed an issue of this series. [ Note: yeah, the last issue I reviewed was #44, back in 2015! ] And a lot has happened over these last 30 issues or so, including the apparent death of Shredder, and the book feeling a lot like a new volume of a series since then. 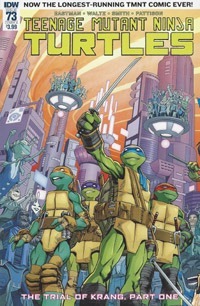 But perhaps most significant for this issue–this is the first TMNT comic series to hit #73! 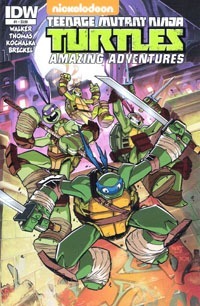 The second volume of Tales of the TMNT ended at #70 back in 2010 (though apparently there was a foreign-published ~100-copies issue put out as a #71, but that’s for another post entirely), and the Archie-published TMNT Adventures ended at #72 back in 1995. The original volume of TMNT, that started everything, ended at #62 back in 1993. 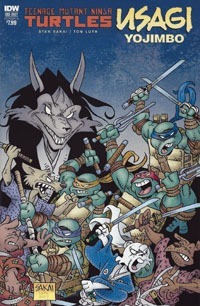 Over the past six years, 73 issues of this title, numerous mini-series, several specials, and a year of a monthly companion title, we’ve had the development of probably the richest, deepest TMNT continuity to date, with this series’ creators drawing in elements from pretty much every previous iteration of the series–be that comics, cartoon, movie, and even the (as of August 2017) current animated series. The cover itself is a bit of a celebratory thing: we see the turtles standing triumphantly, crowds of (alien) people cheering them from all around, as they stand open in the city. Granted, this is an alien city, and not Earth, but hey…it works. 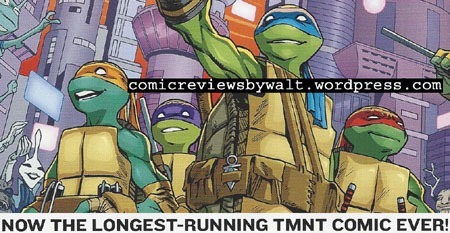 And on the "meta" level, the celebration is also appropriate AS celebrating this being the longest-running TMNT comic ever (at least numerically), with no signs of slowing down. Opening the issue, we see Krang–who outside of the FCBD 2017 issue, I don’t think we’ve seen in a couple years at least–firming stuff up with an assassin, as he sits in a guarded cell awaiting his trial. Neutrinos arrive on Earth to get the turtles and Fugitoid back to Smada city, where they’re surprised to come face to face with Leatherhead! After some initial testiness, the situation is explained as to why he’s there and that they’re all on the same side…for now. The Neutrino Royal Family celebrates the turtles as heroes of the Krang War in a huge gathering that they weren’t expecting. Later, they get a smaller, more private time with them, where they learn of other problems approaching…like Maligna and her Malignoids, seeking to fill the power vacuum left without General Krang. The group is joined by Counselor Apap, who reveals how important it is for the turtles and Professor Honeycutt (the Fugitoid) to retrieve the key witnesses…without them, they don’t have nearly what’s needed to keep Krang locked away! However, Krang’s assassin Hakk-r strikes, and Apap is killed. 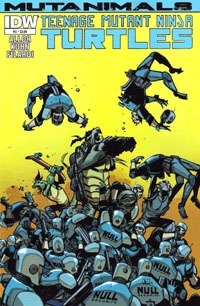 After a skirmish with the assassin (who escapes), it becomes the turtles’ mission to seek out the witnesses, as Honeycutt must remain behind…he’s suddenly become one of the most valuable players in things himself, with Apap gone…so the turtles head off to collect the witnesses. This issue is really, truly, things Done Right, to me! If you’d told me several years ago I’d like the Neutrinos in a modern context, I’d’ve been quite skeptical. As they are here, in this series…I quite enjoy them! I "hear" echoes of the classic cartoon iterations of the characters, but really dig this series’ reinterpretation and presentation of them…and their society. I also really like that this Krang is a much deeper character with a fleshed-out background (compared to the cartoon, anyway!) and seems much more capable, and highly dangerous…far more of a threat than "just" some recurring, bumbling villain. Visually, while this issue’s art is by Cory Smith rather than Mateus Santolouco, it’s similar enough to avoid being jarring, and is really some beautiful stuff! Over the years, I’ve gotten very used to radically differing visual interpretations of the turtles, so that in itself rarely bothers me. Having the art so similar is a real treat, and to be singularly attractive in itself is even better! The issue’s story is also quite a treat to me…I really like that we’re (finally!) getting back to more "familiar" territory, while pushing the overall narrative FORWARD. I often complain about repetition and titles not "letting _____ go" and such…but the way Shredder was developed, and Krang, I very much like stories with them in this iteration of the TMNT. Having had what in some ways has felt very "generic" villains/antagonists for a couple years, it’s really great to have this picking bac up on stuff that I’ve missed. Having recently been excited at the introduction of more classic Mutanimals characters (Jagwar and Dreadmon) being introduced (reinterpreted) into current IDW continuity, I’m also very excited at the prospect of what seems to be on the immediate horizon, with a couple of very recognizable "cameos" in this issue (that I presume will be touched on at length in the TMNT: Dimension X mini-series) and an outright mention of another "classic" villain that I believe may come into play next issue, given the "Next issue" box at the end of this issue. While this may not be an ideal "jumping on" point for someone unfamiliar with the characters, it’s definitely a great point to come back if you haven’t cared much for stuff the last couple years (since #50, for example). It’s also not a horrible point to jump in, though, even if you haven’t followed this title since its inception back in 2011 or such. There’s a lot of context, and if you don’t mind stories where you jump in and "figure things out" as you go, it’ll probably be fairly enjoyable. And, as said earlier…this is the highest-numbered TMNT issue ever, so even symbolically, this series has now surpassed every previous run and can truly come into its own, pushing the TMNT property forward with a pedigree more than equal to everything else! Aside from the price, I’ve enjoyed these Deviations issues (having read the Ghostbusters and the GI Joe issues prior to this one). My most obvious comparison to describe the Deviations designation is that these are IDW‘s version of the classic Marvel series What If..? That is, a key story point is chosen, an an alternative outcome is explored. For obvious reasons, IDW phrases it In a World… Where _______ happened! instead of What If… _______ happened?, but the result is functionally the same. This issue (as with the other four one-shots) carry a hefty $4.99 cover price…hefty in general, though admittedly not drastically beyond the standard $3.99 price point of regular-sized issues. In a world where the turtles join Shredder, we find a hunted Splinter struggling to survive against his sons, who have been fully brainwashed into Shredder’s control and the world of the Foot. Old Hob is brought into things–the turtles getting Splinter’s location from him–and then the confrontation. The turtles capture Splinter, and present him to Shredder. Total victory nears for Shredder–the turtles have defeated rival gangs, brought Splinter (Hamato Yoshi) to him, and he is at the height of his modern power…and then things crumble. 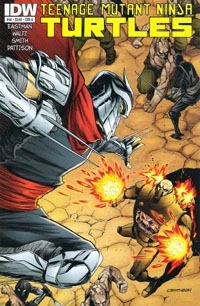 Splinter is not unprepared and–along with Hob and (separately) a revenge-bent Hun (father of Casey Jones, who in this continuity was KILLED by Shredder)–battle is joined, with results rather different from “actual continuity,” establishing a new status quo for this world while leaving us as readers to wonder where things might go from here. While the Ghostbusters issue I read pivots on the original film’s story, and the GI Joe one is more of a generalized thing…this TMNT issue pivots on a specific event within current IDW Comics continuity, specifically the inciting bit of the City Fall arc…where Casey Jones was stabbed (but survived) in this issue, he died; and where Shredder gained control of only Leonardo, here he got all four of the turtles. As with the rest of the TMNT issues, this one involves multiple folks for the story, Waltz for the actual script, and mostly familiar art credits. Howard‘s art fits my memory of City Fall in that while this has its own style visually, it’s not any sort of jarring contrast to Santolouco‘s art. As such, and having followed the IDW series from its start through present I feel more “aware” of stuff with this story and like this is a perfect fit for my expectation of the Deviations books. The story itself works and feels very much like any given issue of the ongoing series, and the art–as mentioned above–fit very well, making for an all around attractive package and enjoyable read. My chief nitpick with this issue is that it is too short and I’m not a fan of paying more for the sort of backmatter included in this issue, artificially inflating the feel of its size. We have 24 story pages, and then 6 pages of The Anatomy of a Page where we see plot, script, layout/pencils, inks, colors, and lettering in progression. I would very much enjoy seeing more exploration of this alternate timeline or even exploration of other alternative outcomes. A world where Raphael never reunited with his brothers. A world where the turtles failed to stop General Krang. A world where the turtles were too late to save Donatello. Etc. To me, this sort of thing would be great for some mini-series…four issues would allow more room than one and would provide for companion volumes to existing TMNT collected volumes. And if a creative team really got involved or an alternate take really hit with fans, it could be revisited multiple times and expand the alternate world. I’d love to say I recommend this to “anyone,” as it IS a one-shot and thus not like one has to invest in multiple issues…but this really seems more like a treat for the longer-time fans. To really appreciate the story, one would have to have read City Fall…otherwise this is just some generic issue with bad turtles working for Shredder. That this hinges on City Fall inherently allows for a lot more context (the first 20-some issues of the series). Certainly recommended for anyone who has followed IDW‘s ongoing TMNT series at any length or at least enjoyed the first few volumes and City Fall. The $4.99 is steep even for the “extra” pages…but it IS a one-shot, cheaper than the 2012 and 2014 Annuals, and the paper stock is sturdy so it at least feels like a much better quality (physically) than many $3.99 books. While Slash and Hob scope out the Null corporation and find heightened security, Mondo and Herman have some downtime. Eventually their new friend–Mutagen Man–joins them, and as the group bonds, Mondo dubs Mutagen Man “Seymour Guts” since he doesn’t have a real name. Hob learns the location of the other mutants–he and Slash return for the rest of the group and launch an assault to save them. Unfortunately, this doesn’t go as well as hoped, which reverses the equation–instead of a group going in to save two, we’re left with two to save a group. 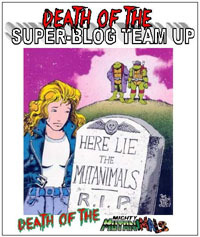 An earlier reference in the main TMNT book to “mutant animals” seemed a nice little reference to the classic Archie-published continuity, expanded and heightened by the use of the actual term “mutanimals.” Getting a mini-series for this “new” version of the characters has been a huge treat (at least conceptually). This issue, though–like the “mutant animals” reference–gives us a familiar adjective that for me totally made the whole issue worthwhile. In the story, though we see the two mutants Hob set out to rescue, we’re not given the names. One looks like it COULD be a character I’m hoping for, but with other alterations for the current continuity as well as possible ownership things, I’m honestly not sure if we COULD see Man Ray or Ray Fillet in this series…same for Jagwar and Dreadmon or Wingnut and Screwloose. 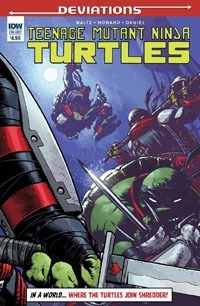 So Mondo (Gecko) is the sole representative of that group of characters for me, and this “contemporary version” of the Mutanimals is a far cry from what I’d prefer–though the story itself is interesting and I definitely welcome continuation and expansion of the IDW TMNT-verse beyond just a single issue of the main title each month. I don’t like that this is only a 4-issue arc…but then, that’s the “standard” and somewhat pigeon-holes stuff, making for shorter stories that maybe COULD be longer or have more ongoing plot threads/subplots. That said, this puts us to the halfway point, and we do meet the head of the Null corporation…something I’d feared would not happen at all or at least not within this series (or not til some epilogue or final-issue reveal). While I definitely appreciate the notion of adding female characters to the TMNT-verse and recognize that named major female characters are quite rare historically in the property…I’m not a fan of this sort of changeup. Still, that’s a gut reaction and other than basically meeting the character and seeing what she does in this issue, we have no idea the actual origin and backstory and all that…and with two issues to go there’s still plenty of room for things to be developed and change my mind or clarify what I might be mis-assuming. Visually I’m not terribly impressed with the issue…but as with the turtles themselves, it seems that one constant is the abundance of different visual depictions of the characters, and not all are necessarily going to be fully to my personal preferences. The art certainly gets across everything going on and I’m not left wondering at the action or any wonky anatomy or weird stuff like that. I definitely enjoy seeing more of Hob and that while the character may be an antagonist to the turtles, he’s not some out and out villain…he’s like a Magneto of sorts, and that works well for me. I’m not used to a “smart” Slash nor a lack of the character seeking his palm tree…but I’m liking this take on the character. I’m particularly eager to get the next issue to find out more about the two new mutants…and I’m quite curious at the future of this version of the Mutagen Man. I’d prefer the classics–Man Ray, Mondo, Wingnut and Screwloose, Jagwar, and Dreadmon–but given sufficent story space and development I could definitely see enjoying this new group and their dynamics quite well. While one may not really have a lot of context for these non-TMNT mutant characters IN the TMNT universe without having read the main TMNT book, this does seem like it works well enough as its own thing as much as any “spin-off” or “tie-in” might. As a second issue, I’d certainly counsel grabbing the first…but unless you’re specifically seeking out the single issues and keeping up on a month-to-month basis that way, you’re just as well off waiting for the inevitable collected volume and get the whole story in one go. If you’re a fan of IDW‘s TMNT continuity, this is certainly a well worthwhile read. It’s been a few months since I’ve covered an issue of this title–I think it was the end of the previous arc. Here we are at the end of the next arc–already! Though we’ve had Krang since the earliest issues, this arc and issue is where the “long arc” of stuff pays off. The Leo, Raph, and Mikey tangle with some of Baxter’s flyborgs, before the scientist recalls them to make his escape…which leaves them free to get the mousers away from the Fugitoid…though this does not go over well with Krang. Meanwhile, Bebop and Rocksteady have been ordered to kill Donatello, and take great pleasure taking on the turtle and Metalhead. While the other turtles face Krang directly, Splinter is aided against Karai by Alopex and Nobody. Back on Burnow Island, Shredder’s mutants fail to help him, and escape…not realizing Baxter has designs on an alliance with their (probably now former) master. The turtles and Fugitoid end Krang’s plans for the Earth though they’re unable to prevent the island from being terraformed. The legacy of their battle is a space on Earth that can be a haven to surviving Utroms. While Honeycutt returns to Dimension X to see Krang answers for his crimes…the turtles return home to find that everyone was too late to save their brother. Even long as the above summary is…it hardly does justice to the feeling I had reading this issue. I was expecting something big–I may have seen something hinting at a major event, or might’ve just felt like there’d “have to” be something big given all the “buildup” to the Technodrome activating and that it’d be a letdown if “all” that happened was that the turtles defeated Krang with no other lasting repercussions. The art and writing together made for quite a scene between Bebop and Rocksteady vs. Donatello…and I honestly felt a bit sick reading it, at seeing Donnie take such an outright beating from the two. Gone are the overblown words and threats and no-one-actually-gets-hurt notion of the turtles facing the supposedly-dangerous lunkheads as we got throughout the ’80s/’90s animated series. Here, as I turned the pages I had a mental flash to Batman: A Death in the Family…exacerbated by the panel of Rocksteady’s hammer-swing quite looking like a crowbar. And though we don’t get detail, we get enough–the crack and crunch on the shell, and my realizion that I’d just been contemplating before that I’d never really read any TMNT story with any of the turtles truly having their shell damaged. They’ll be shown with scratches or cuts and such but the shell is generally shown deflecting a sword blade or some other object…but they’re not superhuman or invulnerable. And we’re shown just enough to SEE that yeah…this is bad. VERY bad. Of course, that itself is made worse by the two talking over what they’d just done, remarking on the damage and what it looks like…definitely solidifying that it wasn’t just some “visual sound effect” and not just some visual angle. And the end of the issue certainly suggests that the turtle family has been truly reduced by one…and yet no one comes out and says the “d-word” here, and I’m reminded of a key scene in the original Eastman/Laird series when Leo’d been horribly beaten by the foot and his near-lifeless body thrown through a window to the floor amidst the rest of the turtles. While mentally processing as I read the rest of the issue, I’d also thought immediately of the Image TMNT series, in which Donatello wound up a cyborg after a horrific accident all but killed him…the specifics remain a blind spot in my TMNT knowledge but given how much this series has drawn from prior incarnations of the property, I certainly have some expectation of where things can go from here…it’ll be the details and pace that are gonna hold my attention in a big way. 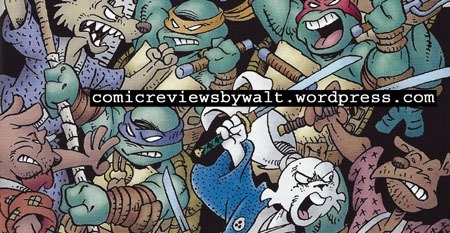 The immediacy of the issue–it’s the current issue as of this writing; it just came out this week; there’ve been no other new TMNT issues SINCE–certainly lends to a sense of importance by itself. Yet, I do truly think that in the long run, this may well be a key, defining issue in the series as well as moment for all the characters…something that’ll be referenced and relevant and to some degree inform the heart of the characters and the series for a good long time. There’s not much “context” given, this is the fourth chapter of a four-part story, so it’s not particularly a jumping-on point. I certainly recommend the series, whether you backtrack to #41 and the start of this arc or pick up the entire series in collected format. Though I hurt for the characters, look forward to seeing how they get through, this remains one of my favorite comics being published currently by any company, and just about the longest I’ve kept up with any single series consistently on a monthly basis for such an extended time since the late-1990s. While not the foundation/building blocks of the property, in terms of story quality, development, longevity, consistency, and quality…this is probably my favorite TMNT series, period…and after this issue I am all the more eager to see what comes, and even at the $3.99 price point, would likely enjoy weekly issues as long as the quality was maintained. This issue gives us a brawl between Bebop & Rocksteady and the Turtles & Mutanimals, as well as Casey bonding with April’s father. All but three pages are the brawl, and while I normally wouldn’t consider myself a fan of all-fight issues (or issues this CLOSE to being “all-fight”), there’s enough characterization within the context of the brawl that I enjoyed it. 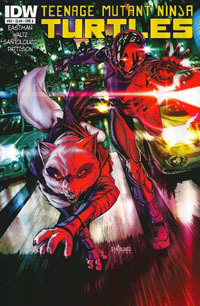 I’m getting a definite (nostalgic, perhaps) sense of Alopex as a stand-in for Ninjara, though “stand-in” may not be quite the wording I’m seeking. At the very least, seeing the way this current IDW TMNT continuity draws from seemingly “everything” that’s come before, I can’t imagine there’s not some influence from the Raph/Ninjara stuff (from the Archie TMNT Adventures) being drawn from in the current Raph/Alopex stuff. I definitely appreciate the threat posed by this version of Rocksteady and Bebop–while they maintain the “dumb grunts” status that seems to have kept them so popular through the years, here they’re shown as the danger they really ought to–and can–be. They’re actually scary, and not ones that can be tricked into a cage or into knocking themselves out running into each other, etc (pick a random episode of the classic cartoon and how the turtles got out of being killed by ’em). Amidst the brawl, we still get “moments” between various characters–Nobody and Alopex, Alopex and Raph, Splinter and Mondo Gecko, Mikey and Slash, etc. We see that these characters have more going on than just the brawl itself. Instead of paper-thin plot points we see how the battle is affecting the characters, and the various alliances…I just see a lot more “complexity” on display here than, say, in the classic TMNT cartoon or the comics adapting episodes of said cartoon. I also continue to LIKE the story-team of Eastman, Curnow, and Waltz over a single writer: I’m thoroughly enjoying this series, and attribute that to the team aspect and presumably more ideas being worked in and “tempered by committee” than we’d get following a single vision. I also continue to REALLY enjoy Santolouco‘s art on this title. This look for the characters works very well to me and (perhaps for its immediacy) is probably my favorite contemporary look–especially for the overall consistency of the past number of issues. The cover is a bit misleading and doesn’t really seem to indicate the issue’s story, but I have to admit it looks good in and of itself. I did have to look closer in the shop to make sure it wasn’t a variant, as it struck me as the sort of image that might be on a variant rather than this particular issue. As the 40th issue, this series is getting “up there” in numbers–it’s hard to believe I started out and have kept up month to month with this title for forty issues now…but I look forward to this (ideally) making it to at least twice this number and perhaps the highest-numbered ongoing TMNT book ever in the 30+ year history of the property. Also as the 40th issue, it’s another “divisible-by-4” number, which means “technically” the end of another arc based on the standard 4-issue collected volumes IDW insists on. Which means you’re probably better off holding for the collected volumes and jump in on the NEXT issue, or simply jumping in on #41 for the “start” of a new arc. But, following the single issues, certainly nothing to this that turns me off or seems like an issue worth skipping.